Green infrastructure utilizes natural systems to absorb and filter stormwater, relying on soil and plant life to remove toxins and recharge ground water supplies. In addition to its positive impact on water quality, green infrastructure can improve air quality, provide habitat for wildlife, generate green jobs, save money through reduced capital expenditures on grey infrastructure, conserve energy and combats the urban heat island effect through shade, insulation, and transpiration. Examples of green infrastructure projects include green & blue roofs, raingardens and biosawles, porous sidewalk & road surfaces, rain barrels, down-spout planters and bluebelts. Simply put, green infrastructure uses soil and vegetation to soak up stormwater before it gets to the sewer system, thus preventing Combined Sewer Overflow which releases untreated sewage and street runoff into the Creek and NY Harbor during rain events. 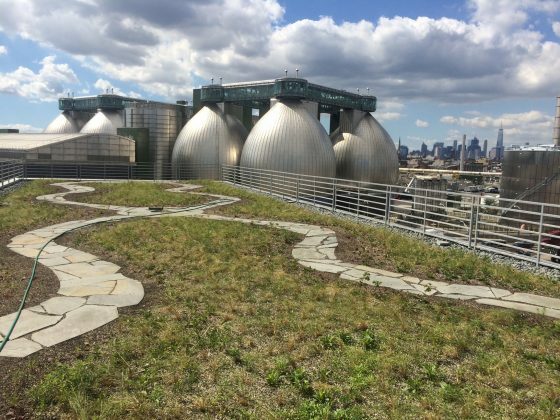 To date, Newtown Creek Alliance has been a leading advocate and community partner in promoting and increasing Green Infrastructure in NYC and within the Newtown Creek watershed. Our work includes working with Green Infrastructure practitioners and firms on project planning, advising city and state agencies on local opportunities and also community education through public workshops and outreach sessions on why Green Infrastructure matters and how residents can help create more. Below are some NCA projects relating to Green Infrastructure and resources to find out more info. NCA has partnered with NYCAudubon, Broadway Stages and Alive Structures to build out a 20,000 sq foot green roof at 520 Kingsland Avenue in Greenpoint. The project features native wildflowers and grasses that will not only soak up rainwater but provide habitat to pollinator and bird populations. Additionally, the roof srves as outdoor classroom for local schools and the general public. Visit the project website here for more info and stay posted to our events for upcoming activities at Kingsland Wildflowers. Partnering with the Pratt Center and the Open Sewer Atlas, we created the Grey to Green campaign which included detailed analysis of storm water capture needs within the community. NCA ran informational sessions and workshops with the NYCDEP to engage the community and to encourage new practices. Check out the Grey to Green website here. With funding from the New York State Pollution Prevention Institute (NYSP2I), NCA conducted thorough research into the land use, policy and economic factors of green roof implementation within industrial areas. We produced outreach materials to better inform property owners and managers of benefits for green roofs and funding opportunities available. Learn more about the program, including a short video on the benefits of green roofs here.